long story short i decided i wanted to migrate the hdd to the ssd but since my hdd was twice as big i had to make it smaller with a partiton manger, i ended up going through and doing so but midway through the partitioning i knocked the wire and it disconnected so ive corrupted the specific partition on my drive. sorrry for the rambling pls help me!! Ok you can try Atola partition find and mount to see if the same problem occur. It is free as well but works only on windows. You can recover files as well directly but speed is slower on the free version.....worth giving it a shot. You can check on this link for more info if you understand french. hey thanks for the reply i tried find and mount but it didnt seem to work for me yesterday ill try again, the drive comes up as raw anytime i try to click on it it asks me to format it, if i use ubuntu will it let me see the files and take what i need off it? I'd need some infos from Analyse first. It's your current partition table and not a Quick or Deeper Search where if you have some read errors TestDisk hangs. If your partition ist still in your partition table, it would be worth to have a boot sector diagnose to get access to your files. Just confirm at Analyse and upload a screen shot. Fiona wrote: I'd need some infos from Analyse first. heres the screenshot after analyse is complete, the one thats corrupted is the OS labelled partiton when i press p lists all of my files i cant access i believe thats a good thing, whats the next step i should take? around quarter to halfway is when the crash happened and the usb disconnected i remember the sector being around something like 2 million out of 6-7 million but yeah hopefully this has given you a picture of what went down. as you can see in the pic it only displays 2 partitions that i can write c:/ and the recovery which leads me to deep scan which ends up with the all the errors/hangs/crashes. So basically i cant tell if its going to write the correct partition table as it seems the sectors are overlapping as it was pointed out to me that the deleted recovery partition ending at 1491, but the next image shows 1490. 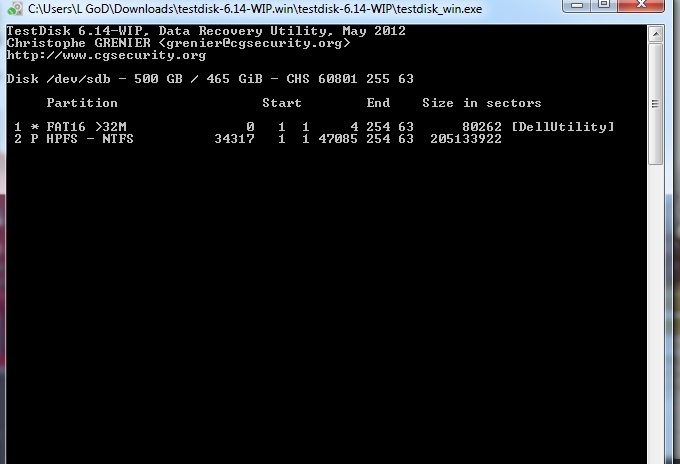 I believe the instructions for solving your problem are listed at http://www.cgsecurity.org/wiki/TestDisk_Step_By_Step. you may want to review the log file for the partition manager you were using to perfom these operations. this should tell you how far along the operations were and in what order they were being performed before losing connection to the device. Your OS-partition has a message that NTFS or exFAT boot is invalid. It means either your boot sector or file system is damaged. Could you diagnose your boot sector first? Please check List and have a try to list your data. If you can watch your data you can restore your boot sector. If your Backup of your boot sector is valid (OK) and you were able to list your data, you can use Backup BS. "Backup BS" copies your backup of your boot sector over your boot sector. Your boot sector should be repaired. 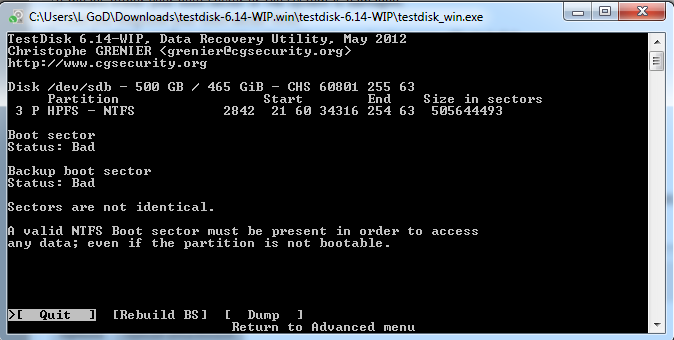 You probably won't boot from your "Recovery" partition either, that's why it should only be primary. theAntiBob wrote: you may want to review the log file for the partition manager you were using to perfom these operations. Fiona wrote: Your OS-partition has a message that NTFS or exFAT boot is invalid. should i go ahead and rebuild the boot sector? EDIT: so i went ahead and tried the rebuilt boot sector and it was going good for a round 5-10 minutes then it froze im not sure whether to stop it or let it run, my usb hdd indicates its not doing anything since the led is not flashing..should i leave it to run or?